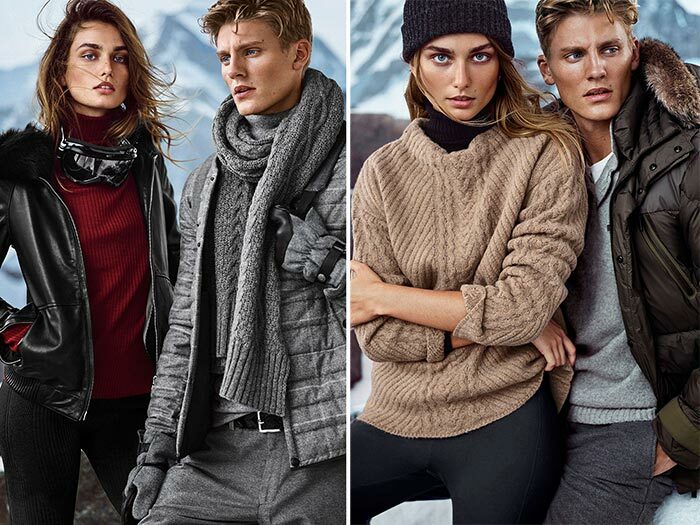 Massimo Dutti has created a stunning collection for winter 2015 with the focus being on skiing. You can see where the Spanish brand drew upon classic styles for inspiration, but everything is clearly created with the modern woman in mind. The brand selected Andreea Diaconu to sport the new fashions for the Massimo Dutti Apres Ski fall 2015 campaign, and the famous Romanian model presents the clothes with the perfect intensity. Featured alongside male model Mikkel Jensen, the duo looks like the perfect, outdoorsy pair for the new apparel. Massimo Dutti had a target in mind when this collection was created, and the execution was maintained from the casting to the overall presentation of the line. Diaconu is the vision of modern women of today. There is structure, comfort, and the ideal winter color palette that just summarizes everything the cold months are about, especially since the collection goes as far as to be featured as a ski line. There are a lot of staple garments in this collection for the woman, who loves taking on the slopes. There are warm leggings, the ‘favorite sweater,’ fun and fluffy scarves, and a variety of cozy jackets to keep the snow at bay. For the rest of the non-skiing population, however, there is no need to fear, because you can still rock these looks in the everyday world, even if you’ve never seen a mountain in your life! One look I’m crazy about is the soft grey pants featuring a pocket detail, and paired with tall black socks and classic leather boots. This outfit looks current in a simple way; there’s nothing distracting you from the pristine seaming in the pant. The styling makes for a great outfit overall, and one that is perfect from the streets to the ski lodge. The campaign itself is ideal, because the setting allowed for the models’ striking blue eyes to pop. The slightly monochromatic background really makes you focus on the clothes and the overall persona the models are portraying, something other strategists overlook due to over-styling or accessorizing. But Massimo Dutti had a plan. They created this seemingly elaborate backstory and designed the collection for one woman, who just so happens to embody the modern woman of today. The garments are perfect for layering with each other or with other toasty clothes you have in your wardrobe. Some of the looks photographed would be complete with an extra layer or two, such as with the cream-colored sweater and bone white leggings. Something worn over those leggings would have added both more warmth and a contrast in color that the sweater needs in order to breathe. Alone, however, each piece is perfect for the goal the brand set out to accomplish. The patterned leggings are practical and interesting, and the sweaters are simple, polished, and cozy-warm. You don’t have to sacrifice warmth for fashion, and you can still look your best at the high mountain altitudes. For the most part, the garments are featured in neutral colors. When you’re out on the slopes, you’re not usually focused on standing out with flashy garments because of practicality, but this campaign shows that you need to let your personality shine if you want people to notice you. You can wear simple clothes and still look stunning; it all comes down to how you present yourself. We’re beyond excited for Massimo Dutti’s Apres Ski fall 2015 collection for the modern skier ” or woman in general ” and the pieces featured can act as an expansion tool for anyone.